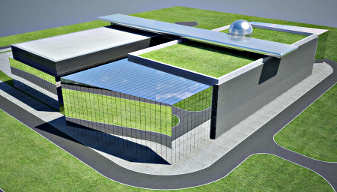 The beginnings of INTER-BUD operations mainly referred to orders for repairs, which gradually brought medium-scope and large projects, as well as projects contracted out by domestic and foreign investors.In less then twenty years, we have constructed a wide range of public, housing, industrial, commercial and sporting facilities. Our services have been rendered to multiple companies, hotels, embassies, cities and local communes. One of our major projects was undoubtedly the comprehensive modernization of the Market Square section, involving restoration of the historic pavement around the St Wojciech Church and construction coverage for the archeological work on the monuments of the Great Scales and Rich Stalls. 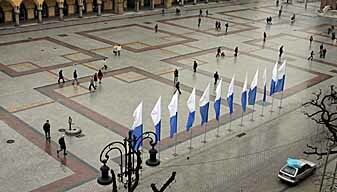 The success of timely completion of the work with a high standard and 10-year warranty is owed to excellent work organization in the entire team of over 130 persons engaged in this project, with archeological work performed simultaneously.The project included renovation of the architectural elements known from the Market west side, which resulted in a new outstanding Market Square section, being Krakow’s and INTER-BUD’s representative location. The Polish Association of Construction Engineers and Technicians, Ministry of Infrastructure and General Office of Building Control appreciated the efforts, work and effects of the project by awarding the first prize in the PACET competition of the “Best Construction Project of 2004” to Inter-Bud for the rebuilt of the western section of Krakow’s Market Square. All of our customers recognized INTER-BUD personnel competence and completion of projects in a timely manner. Their recommendations help us to convince new Investors that high quality and professionalism are guaranteed for their projects. Our customers include: Jagiellonian University, Philip Morris Poland, Warbud, Budimex – Dromex, Budostal-2, Mitex, Echo Investment, Dom Development, Poor Poland, Hochtief Poland, Telekomunikacja Poland, Road and Transportation Management in Krakow, Polish Railways, PKN Orlen, Sobiesław Zasada Developer, Polish Academy of Science – Institute of Pharmacology, Regional Water Management Board, Municipal Housing Administration.